Debbie Gaspich is director of product management, North America, for Norton Abrasives; www.nortonabrasives.com. 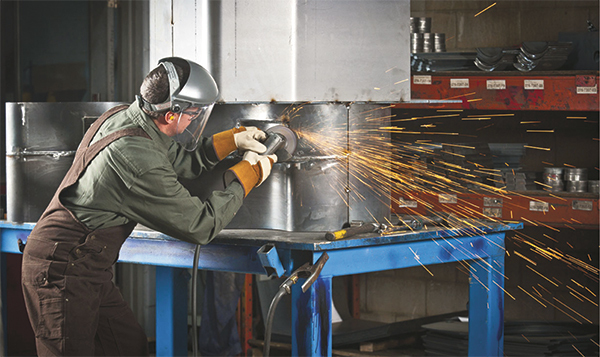 Job shops as well as production-manufacturing operations will find that the abrasive products outfitted to their hand-held power tools can play a crucial role in increasing productivity. Often viewed as a negligible expense, abrasives comprise on average less than 2 percent of the total cost of a fabricating operation. However, most shops fail to realize that 10 to 15 percent of their labor is consumed in metal-fabrication and finishing operations. So, rather than simply considering the direct cost on the distributor’s product invoice, a more accurate measure of productivity would be to look at the true total process cost, or the total work to be performed with abrasives. The abrasive grain is a cutting tool, and the type and quality of the grain can determine the true value of the performance of an abrasive tool. Performance grains deliver benefits such as higher stock-removal rates, increased product life, reduced metallurgical damage and less wear and tear on grinding machines. And, these grains are ergonomically friendly. All of these factors work to minimize the total cost of the grinding process. The most-competitive production operations evaluate these factors when making their purchasing decisions. Abrasive grains can be made by several manufacturing methods. Some are made in large ingots in furnaces, crushed and then sorted by grit size and shape to be used in abrasive tools such as grinding or cutting wheels and sanding products. Other grains are manufactured using molding technology, which produces precision-shaped grains that offer a more uniform structure and size. Precision-shaped grains can be made into different shapes and sizes depending on the market needs. They generally cut quickly and perform well in precision metal-removal applications requiring tight tolerances and fine scratch patterns. However, it is important to consider the application at hand, as some characteristics of precision-shaped grains—such as bond quality, grain orientation, grain hardness and friability—can make them less effective for rough grinding jobs. Wheel manufacturers often expend considerable effort to develop a proprietary mixture of grains that will provide optimal performance. For example, in certain grinding- and cutting-wheel lines, Norton offers a proprietary blend of ceramic-alumina and zirconia-alumina grains. These proprietary grains microfracture as they break down, continuously exposing new cutting surfaces—essentially self-sharpening. Compared to the grains on more traditional grinding wheels, these fresh cutting points provide a faster cut rate, higher rate of metal removal and longer wheel life, as the grains can be completely utilized through the microfracturing process. So, rather than prematurely expelling rounded or worn aluminum-oxide grains at only a fraction of their life, microstructure grains such as ceramic alumina and zirconia alumina work together to cut cooler, allowing the wheel to hold onto the grain longer to extend wheel life. The key to optimizing performance of an abrasive-grinding and cutting operation is the selection of the best-suited wheel to the particular application. When selecting the best wheel for the job, consider several factors including external budgetary rules and the available power sources—low voltage, low air pressure for example—and whether cost reduction and process optimization throughput are the main goals. Many abrasives manufacturers provide grinding solutions geared to meeting specific applications, ranging from rapid stock removal to precision finishing. There are several different methods of evaluating the performance of abrasive wheels. Some wheels are hard-acting—they may last a long time but not remove much material. Other wheels are soft-acting—they cut quickly but do not last very long. To attain the true value of a wheel, combine its cutting action and wheel life. A high-performance wheel provides a very good cut rate and wheel life for the highest total metal removed over the life of the wheel. Measuring and tracking these factors can reveal opportunities to reduce the total cost of an operation, solving production bottlenecks and reducing total fabrication costs. To illustrate how to measure and compare total wheel performance, consider the accompanying graph comparing the productivity of a wheel with precision-shaped grains and a wheel with a proprietary ceramic-alumina and zirconia-alumina mix. When compared with using a standard grinding operation, the wheel containing precision-shaped grains cuts very quickly during the initial few minutes of grinding. However, since the grains cannot microfracture under the grinding pressure, the wheel will grind more slowly after several minutes. The grains prematurely expel and wear very quickly so that the final life of the wheel tends to be very short. In contrast, the wheel with the proprietary mix of grains maintains the same cut rate throughout its life, which is nearly three times longer than the wheel with the precision-shaped grains. This is due to the microfracturing characteristics of the two grains. Over the life of the wheel, it removes more than 2.5 times the material than the wheel containing the precision-shaped grains. If you prefer to be sure it stays neighborhood, figure out the things they are able to supply you with to get going for a low funds. As you start to see increased sales volume, then devote several of those profits in the direction of other SEO campaigns. Repeat this process till you've got all you need and want securely in place. So where would you start? The first thing you can do is start off out incorporating local to your own key terms. A great example is if you are attempting to sell essential oils, your own key words can possibly be"essential oils," or"high quality essential oils." Now you wish to present neighborhood, which means you turn your key word into a long-term keyword with place, such as"essential oils London" or"essential oils in New York" as illustrations.